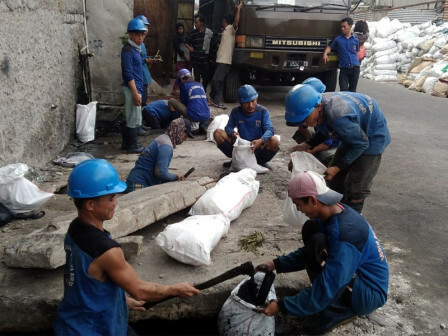 Grogol Petamburan Water Resources (SDA) Unit dredges five connecting (PHB) channels in Tomang, Wijaya Kusuma, and Jelambar Urban Villages, West Jakarta.
" Total length of these five channels that we dredge is about 1.5 kilometers"
Grogol Petamburan SDA Unit Head, Yusuf Kasim said, mud dredging is done in five channels to follow up RW and Urban Village Head requests. "Total length of these five channels that we dredge is about 1.5 kilometers," he stated, Thursday (11/1). These five channels are located on Jalan Widara Raya RW 07, Wijaya Kusuma Urban Village; Jalan Jelambar Madya Raya Kavling Polri RW 09 and Empang Bahagia RW 06, Jelambar Urban Village. Then two PHB channels in Tomang Urban Village which are located on Rawa Kepa RW 11 and Tomang Tinggi IV RW 06. Mud sediment thickness in five channels are varies between 50 to 80 centimeters. About 1,500 sacks full of mud are transported from those five channels every day. "We dredge all mud sedimentation thus channels can be optimal for storing rainwater," he explained.